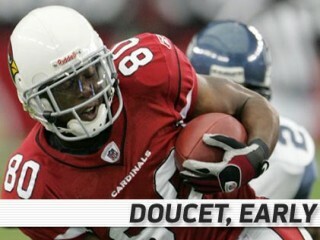 Early Doucet is an American football wide receiver for the Arizona Cardinals of the National Football League. He was drafted by the Cardinals in the third round of the 2008 NFL Draft. He played college football at Louisiana State. The Cardinals third-round selection (81st overall) in the 2008 NFL Draft, has appeared in 16 regular season games and four postseason games (one start) in his first two NFL seasons. 2009: After battling injuries during training camp, came on late in the season, playing in nine games and both postseason contests … inactive (ribs) vs. SF (9/13) … inactive for the next six games … with Anquan Boldin (ankle) out with an injury, saw first action of the season, registering four receptions for 31 yards @ Chi (11/8) … hauled in a 20-yard reception to convert a 3rd-and-4 from the AZ 13-yard line with 2:47 left and Arizona up by eight points @ StL (11/22) ... recorded a career-long 29-yard reception as part of a team-high 41 yards receiving @ SF (12/14); marked the Cardinals longest play of the game … registered a career-high two special teams tackles @ Det (12/20) … recorded first career TD and totaled 43 yards on two receptions vs. StL (12/27) … logged his first career start as part of a three WR set and saw increased role with Boldin injured, registering six receptions for a career-high 77 yards and two TDs in the Wild Card matchup vs. GB (1/10/10) … returned to his home state and led the Cardinals with a career-best eight receptions for 68 yards @ NO (1/16/10); after not catching a TD pass in his first 16 games (regular and postseason) he had three in his last four games. 2008: Struggled with injuries during his rookie year playing in only nine of 20 games ... after missing most of training camp with a hamstring injury was inactive for the first four games of the season ... in first NFL game registered six receptions for 42 yards vs. Buf (10/5); first two career receptions came on third downs and resulted in first downs ... inactive (groin) @ StL (11/2) … inactive for the next four games ... saw time in place of WR Steve Breaston who left the game near the end of the second quarter with a rib injury, but returned in the third quarter vs. StL (12/7) ... for the second straight week saw increased role due to an injury to Boldin and registered four receptions for 29 yards including a season long 12-yard reception and first career special teams tackle vs. Sea (12/28) ... saw first career postseason action, helping to fill in for the injured Boldin (hamstring), and recorded first career playoff reception @ Car (1/10/09) ... saw action at receiver, but did not record any statistics in the NFC Championship win vs. Phi (1/19/09) ... DNP in Super Bowl XLIII vs. Pit (2/1/09). Played in 47 games (24 starts) and finished third in LSU history in career receiving TDs (20), fourth in career receptions (160), and ninth in career receiving yards (1,943) … will go down in LSU lore as having one of the greatest catches in school history with his 39-yard TD reception from JaMarcus Russell late in the fourth quarter against Arizona State in the 2005 season opener; the catch came on a fourth-and-10 situation and sent the Tigers to the victory over the Sun Devils in what was LSU’s first game after Hurricane Katrina … as a senior, led LSU’s National Championship team with 57 receptions for 525 yards and five TDs despite missing five games with a groin injury … finished off his college career in grand fashion, leading the Tigers with seven receptions for 57 yards and a TD in the BCS title game vs. Ohio State … played in 13 games (six starts) as a junior and finished the season ranked second on the team with 59 catches for 772 yards and eight TDs ... named to the All-SEC second team by the league coaches as a return specialist and accounted for a team-best 1,032 all-purpose yards (772 receiving, 202 kickoff returns, 59 rushing) for an average of 79.4 per game … played in 12 games (five starts) as a sophomore and finished the season with 26 catches for 389 yards and five TDs … appeared in all 12 games with three starts as a true freshman. Full name Early Joseph Doucet III … attended St. Martinville (LA) High School where he was regarded as the best WR in the country and top prospect in Louisiana by College Football News as a senior … finished his high school career with 7,104 all-purpose yards and 79 TDs, including running for 3,592 yards on 470 carries and 52 TDs … earned All-American first-team honors from Parade Magazine as senior after rushing for 850 yards and passing for over 750 yards while accounting for 30 TDs, despite suffering from a hamstring injury … was also a standout basketball player, helping the Tigers win the Class 4A State Basketball Championship as a sophomore … Sports Studies major at LSU.